Troymet Updates Projects | Troymet Exploration Corp.
March 3, 2016 - Troymet Exploration Corp. (TSXV: TYE) (“Troymet” or the Company”) is pleased to update progress on its exploration projects. Troymet operates the Redhill and Golden Eagle projects in British Columbia and the Wildcat project located in Utah. Hudbay Minerals Inc. operates the McClarty Lake VMS project in Manitoba (Hudbay 60%; Troymet 40%). Troymet plans drilling programs on the Redhill and Wildcat projects. Both are considered to have high discovery potential. Troymet is fully funded (+$1,000,000) for its proposed drill programs on the Redhill and Wildcat projects. An application for a permit to conduct a 2016 drill program on the Wildcat project was submitted to the State of Utah and the Bureau of Land Management (BLM) in January 2016. Troymet is awaiting approval of the permit. Planning for a drill program is well advanced. Troymet’s 2015 field program successfully identified numerous prospective structural drill targets along the Joy Fault and in cross cutting structures. The Company has documented exploration progress on the Wildcat project in a series of news releases issued between November 10, 2015 and February 17, 2016. The news releases can be found on the Company’s website at www.troymet.com/news/2016. Troymet’s exploration focus is gold and silver mineralization in veins, stockworks, breccias and bulk-tonnage deposits along the Joy Fault, and in structural/stratigraphic hosts in Cambrian carbonate rocks. Troymet has received a British Columbia Mines Act multi-year permit for its proposed 2016 diamond drilling and geophysical program on the Alpha and Beta zones. The Company’s 2015 field program identified several volcanogenic massive sulphide (VMS) targets associated with interflow horizons within a stacked sequence of felsic volcanics. The undrilled targets have associated electromagnetic (EM) conductors and copper- and zinc-in-soil anomalies. Troymet’s re-assay of an intersection in an historic drill hole (DDH RH06-25) returned 8.75% copper, 4.75% zinc, 1.22 g/t gold and 61.19 g/t silver over 2.04 metres. This intersection, which remains un-bracketed, confirms the prospectivity of the un-drilled VMS targets. In addition, a new +1,000m trend of elevated to anomalous gold-in-soil values was identified. Troymet plans a reconnaissance, induced polarization survey over the strongest EM anomalies, the high-grade intersection in hole RH06-25 and the new +1,000m gold soil anomaly to help in targeting prior to drilling. Troymet has documented exploration progress on the Redhill project in a series of news releases issued between September 2, 2015 and December 1, 2015. The news releases can be found on the Company’s website at www.troymet.com/news/2016. 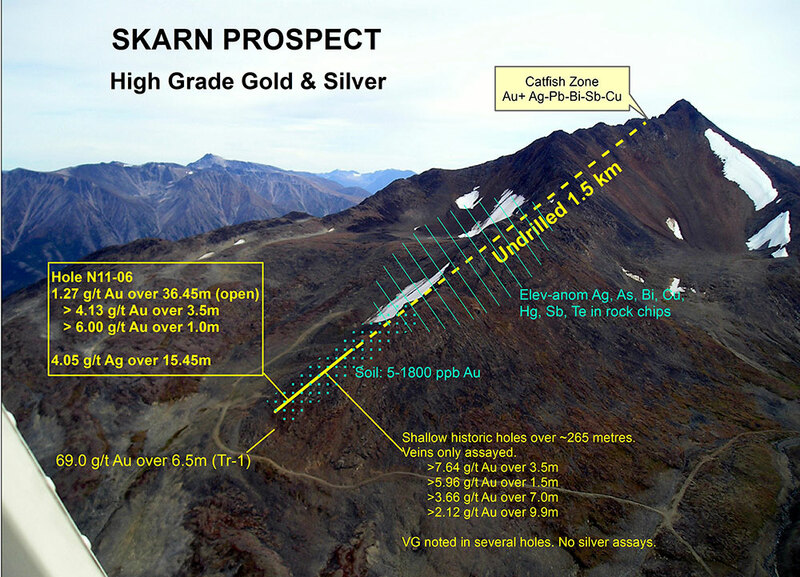 This intersection demonstrated the potential for high-grade, sub-cropping, bulk-tonnage gold mineralization that was not recognized in the past. A compilation of the pertinent exploration data can be viewed at: Skarn Prospect. As previously announced (news release dated December 15, 2015), Hudbay Mining Inc., the Joint Venture operator, has advised Troymet that it plans to conduct ground geophysical surveys over newly staked targets once ice conditions permit. Under the terms of the Joint Venture Agreement, Hudbay must contribute $1,151,052 in joint venture expenditures before Troymet is required to fund its participating interest. Troymet Exploration Corp. is a junior exploration company with a solid treasury (+$1,000,000) and with projects in British Columbia (Redhill and Golden Eagle), Manitoba (McClarty Lake) and Utah (Wildcat).Troymet operates the Wildcat, Redhill and Golden Eagle projects.Hudbay Minerals Inc. is the operator of the McClarty Lake joint venture and must contribute $1,151,052 in joint venture expenditures before Troymet is required to fund its participating interest.Troymet retains a 2% net smelter returns royalty (NSR) on the Key property, British Columbia, which was sold to New Gold Inc. in 2013. Please visit us at Booth 2945 at the Prospectors and Developers Association of Canada (PDAC) convention in Toronto (March 6 - 9, 2016). This news release contains certain forward-looking information. All statements included herein, other than statements of historical fact, are forward-looking information and such information involves various risks and uncertainties. In particular, this news release contains forward-looking information in respect of: the Redhill, Golden Eagle, Wildcat and McClarty Lake Projects, including the possible exploration and development of the Redhill, Golden Eagle, Wildcat and McClarty Lake Projects; the exploration potential and analogous deposit potential of the Redhill, Golden Eagle, Wildcat and McClarty Lake Projects; future data analysis, sampling plans and exploration plans on the Redhill, Wildcat and McClarty Lake Projects; the timing for exploration and drilling on the Redhill, Golden Eagle, Wildcat and McClarty LakeProjects; exploration targets and the potential of such exploration targets; and the ability and the timeframe within which the Redhill, Golden Eagle, Wildcat and McClarty Lake Projects can be advanced. There can be no assurance that such information will prove to be accurate, and actual results and future events could differ materially from those anticipated in such information. This forward-looking information reflects Troymet’s current beliefs and is based on information currently available to Troymet and on assumptions Troymet believes are reasonable. These assumptions include, but are not limited to: the current share price of Troymet’s common shares and the ability to raise future equity financing, if needed, at prices acceptable to Troymet; Troymet’s current and initial understanding and analysis of the Redhill, Golden Eagle, Wildcat and McClarty Lake Projects; the ability of Troymet to discover viable exploration targets and the results of exploration on the Redhill, Golden Eagle, Wildcat and McClarty Lake Projects; the cost of exploration, including sampling and drilling, on the Redhill, Golden Eagle, Wildcat and McClarty Lake Projects; Troymet’s general and administrative costs remaining constant; and the market acceptance of Troymet’s business strategy. Forward-looking information is subject to known and unknown risks, uncertainties and other factors which may cause the actual results, level of activity, performance or achievements of Troymet to be materially different from those expressed or implied by such forward-looking information. Such risks and other factors may include, but are not limited to: the early stage development of Troymet and its projects, and in particular, the Redhill, Golden Eagle, Wildcat and McClarty Lake Projects; general business, economic, competitive, political and social uncertainties; capital market conditions and market prices for securities, junior market securities and mining exploration company securities; commodity prices; the actual results of current exploration and development or operational activities; competition; changes in project parameters as plans continue to be refined; accidents and other risks inherent in the mining industry; lack of insurance; delay or failure to receive board or regulatory approvals; changes in legislation, including environmental legislation, affecting Troymet; timing and availability of external financing on acceptable terms; conclusions of economic evaluations; and lack of qualified, skilled labour or loss of key individuals. A description of other assumptions used to develop such forward-looking information and a description of other risk factors that may cause actual results to differ materially from forward-looking information can be found in Troymet’s disclosure documents on the SEDAR website at www.sedar.com.Troymet does not undertake to update any forward-looking information except in accordance with applicable securities laws.